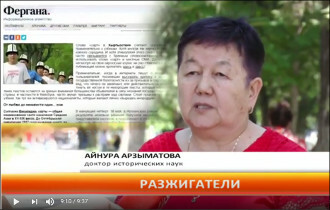 In the evening on 27 May 2017 the major television channel of Kyrgyzstan aired an 8-minute report with the speaking name ‘Instigators,’ in which the Bishkek journalist Ulugbek Babakulov was accused of inciting ethnic hatred, and the website of the Fergana News Agency was called ‘biased’ and called to be blocked on the territory of the republic. ‘It should be noted that during the past year and especially in anticipation of the upcoming elections of the head of state, Kyrgyz authorities have increased the propaganda and judicial pressure on the opposition and the media, which international human rights activists had already noted. Moreover, every time there is one pattern. First - a massive manipulation of public opinion, the preparation of the audience. And after such statements sounded on TV a journalist or politician is usually deprived of liberty,’ Mr Kislov said. ‘Such events, such ‘bullying’ - not new for us. Several years ago, a similar situation - the blocking of our website by the decision of the parliament and the heavy accusations of ‘inciting’ - we have already experienced them. It happened immediately after the events of June 2010, when an inter-ethnic carnage broke out in southern Kyrgyzstan as a result of which the Uzbek minority suffered much more,’ Mr Kislov continued. ‘We tried to provide the most neutral and truthful coverage of events from all sides, yet giving priority to the voices of the victims. “Patriots” wildly disliked it - both in the street and in the power. I take these new attacks on Ulugbek as a personal challenge and a declaration of war on our publication, one of the few independent media in Central Asia. I would not be surprised if our journalist or our publication is brought to court,’ Daniil Kislov said. According to the editor, it is obvious that this story was produced on the main television channel of the country after the regular publication of Mr Babakulov dedicated to the personality and career of the potential president of Kyrgyzstan (protégé of Atambayev) Sooronbai Jeenbekov. ‘Against the background of well-known lawsuits filed in Kyrgyzstan against well-known journalists, leading media, and political opposition leaders, it becomes clear that the purpose of this propaganda campaign of the state is to jam the voice of our agency. It is especially important for the authorities to do this before the election of the head of state in order to finally clean up the information field of the country,’ Mr Kislov concluded.